The Financial Services Compensation Scheme works by protecting consumers who have been let down by financial services firms. I was commissioned by the FSCS to shoot some case study portraits with their senior client, Mike, who’d benefited from their help. I was tasked with shooting some photographs of Mike on location at his home in London. 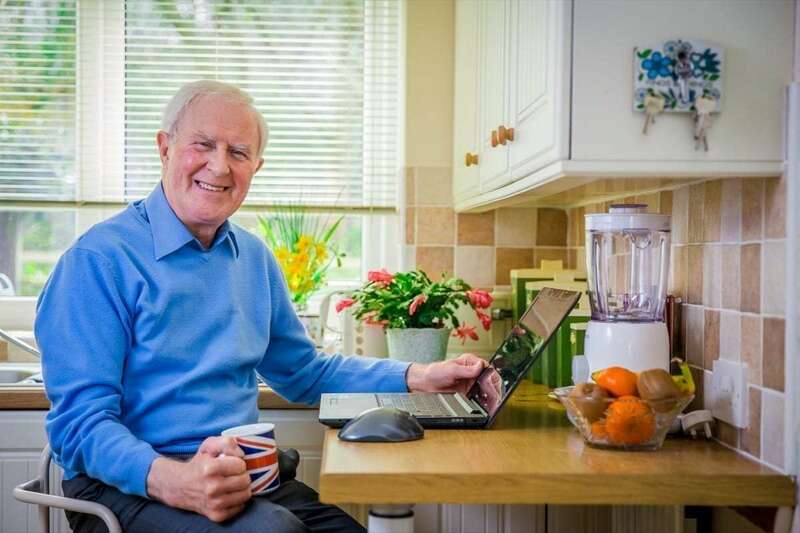 The brief was simple – I had to capture Mike performing everyday tasks, such as standing in the kitchen, making himself a snack, reading a book or working on the computer. Luckily, with my wedding photography experience, I’m pretty good at being invisible, which helped Mike to act as naturally as possible! Mike and I had an hour to get all of our shots together, so we got started in the kitchen. I didn’t have a lot of space in here to work with, so I just brought two small lights to enhance the area a little. I tried to make Mike feel as comfortable as possible and simply asked him to do what he normally would, but to look at the camera every once in a while. Later we moved into the living room where we made the most of the natural light available to us. I’d asked Mike to read a book or look out of the window, and thankfully we were blessed with good weather! He had a beautiful home, so I made sure I also got some photographs of him standing by the mantelpiece as well as in front of some family pictures. The final shot happened almost by mistake – Mike was standing in front of a fence as he was saying goodbye. I thought it would look great in my case study portraits so I made one final snap before we parted ways. I’m pleased to say the FSCS have used my photographs in a variety of marketing channels, from press releases to the case study below. They also gave me a 5-star review! Mike was a joy to work with and it was lovely to see my work published in these professional formats. If you’d like to know more about my case study portraits, feel free to get in touch via my contact page.